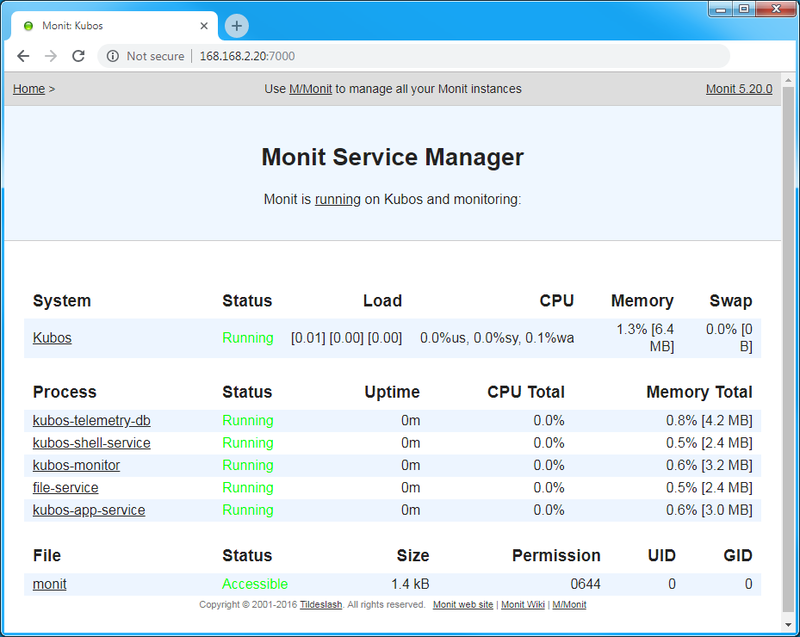 KubOS uses Monit in order to monitor its services and other continuous processes. Monit makes periodic checks to ensure that all defined processes are still running. If it finds that a process is no longer running, it issues a log message and then attempts to restart the process. The default behavior for Monit is defined in /etc/monitrc. Monit is started as a background daemon during system boot. The daemon will sleep for 60 seconds between each process-checking cycle. Monit has its own dedicated log file, /var/log/monit.log. If and when the log file becomes too large, it will be moved to an archive file using the standard log rotation method. If, for some reason, the Monit daemon process dies, it will automatically be restarted. This behavior is controlled by the init system and is defined in /etc/inittab. The current status of everything Monit is monitoring can be viewed in one of two ways. Alternatively, the status info can be viewed by opening a web browser on a host machine (not the OBC) and opening up a connection to port 7000 on the OBC. A login dialog will be presented; the login credentials are kubos/Kubos123. The items Monit keeps track of are defined in control files. We have found it easiest to create one file per process which should be monitored. This keeps configuration more modular and makes it easy to add or remove monitoring for a process. Please see the Monit documentation for information regarding the syntax of these files. If Monit’s configuration is changed, the monit reload command can be used in order to make the Monit daemon re-read its configuration files and process the alterations. If a service has had to be restarted too many times, the status and monitoring status fields returned by monit status will both be set to unmonitored. /etc/monit.d - This is the main configuration folder for system-level monitoring. Configuration files should be added here for services which exist and operate within the root file system. /home/system/etc/monit.d - This is the secondary configuration folder for user-level monitoring. Configuration files should be added here for services or processes which exist and operate within the user data partition.